Awarded Best Sagging Serum for firming skin by Truth in Aging. 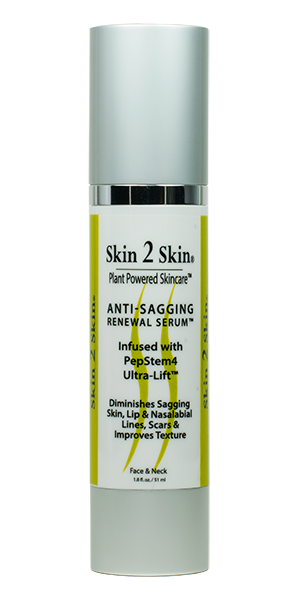 Skin 2 Skin’s Anti-Sagging Renewal Serum with PepStem4™ Ultra-Lift. It is a highly concentrated lifting serum which results in a more youthful appearance. The Green Tea Stem Cell is known as the “Fountain of Youth Stem Cell” for its powerful ability to renew skins youthful appearance. Anti-Sagging Renewal Serum is a sophisticated and advanced skin nourishing ultra-lift and firming anti-aging booster serum that immediately improves the texture and feel of the skin. On application skin feels extraordinarily smooth, soft and moisturized. Give your skin the boost it needs to treat sagging, drooping or slaking skin, lip and nasal labial lines and improve the appearance of new and old scars. 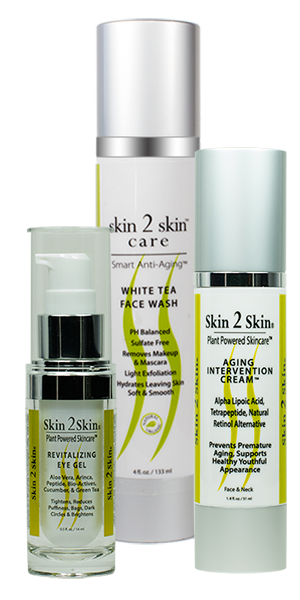 Makeup glides on with Skin 2 Skin’s skin wellness products and helps keep it in place. Aloe Vera Leaf Juice – Is a rich anti-oxidant nutritional skin juice creating a stronger, ageing resistant skin for the appearance of healthy youthful skin. 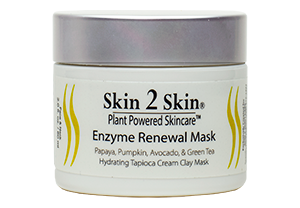 “Your products have incredible corrective powers. I used the Anti-Sagging Renewal Serum and it saved my skin. I have no visible sagging or scaring.” Vicki, FL.